Here you have the full list of stores carrying women's tall clothing. It is the complete mixture of tall specialty stores, regular stores carrying tall sizes, plus size stores, maternity stores, and stores carrying designer jeans and pants in long inseams. If there's an easy way to find the women's tall sizes on any of these sites, I'll tell you. No sense wasting time if you don't have to. I, also, point out if a store has retail locations, although this does not guarantee that they carry tall sizes there. Make sure to call ahead and ask before making the trip to the mall. 9 Months to Grow - $$ | up to 35" inseam | Maternity clothing store. Collection of tall maternity jeans in 34" and 35" inseams. Also offers a small selection of long maternity pants. Aeropostale - $ | 34" inseam | Casual apparel targeting the younger crowd. Long size jeans and pants in 34" inseams. Use "Shop by Size" feature in the Jeans category of the Bottoms section. Also has longer length tops. Shop online or at retail locations. Alloy Apparel - $ | up to 39" inseam | Casual apparel targeting the younger crowd. Tall juniors jeans and pants (casual, dressy, and active) in 35", 37", and 39" inseams. Also offers ladies tall dresses and skirts in extended lengths. Select the Tall Shop to view all tall clothes. Plus sizes available for tall women clothing. American Eagle - $ | up to 36" inseam | Casual apparel targeting the younger crowd. Tall girls jeans and pants in long (34.5" to 35" inseam) and extra-long (36" inseam). Choose your length in the Sizes drop-down menu. Also has longer length juniors tops. Shop online or at retail locations. Ann Taylor - $$ | 35" inseam | Sophisticated, classic style including a variety of professional and businesswear fashions. Long ladies jeans and pants in 35" inseams. Also carries women's tall clothing such as tops, dresses, skirts, suits, and jackets in longer proportions. Select Tall in the main menu. Shop online or at retail locations. Anthropologie - $$$ | up to 36" inseam | Unique, modern clothing. Jeans and pants are designer brands and certain styles can be found in up to 36" inseams. Also has longer length tops. Shop online or at retail locations. Athleta - $$ | up to 35" inseam | Athletic clothing for the active woman. Activewear pants in up to 35" inseams including tall yoga pants, running pants, exercise pants, hiking pants, travel pants, ski pants, and leggings. Also offers casual dresses and skirts, workout tops and tanks, and swimsuits in tall sizes. See the special Tall Sizes section in each category. Avenue - $ | up to 35" inseam | Specializes in plus size clothing. Find plus size tall jeans and pants in up to 35" inseams. Select Tall Pants or Tall Jeans under the Special Sizes menu. Banana Republic - $$ | 36" inseam | Fashionable, contemporary businesswear and apparel. Wide variety of long size jeans and pants in 36" inseams. 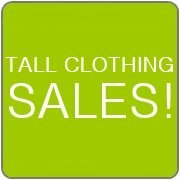 Also offers tops, dress shirts, sweaters, dresses, skirts, suits, and professional jackets in tall ladies sizes. Select the Women's Tall category to view all tall clothing. Shop online or at retail locations. Barefoot Maternity - $$$ | up to 40" inseam | Maternity clothing store. Tall maternity jeans and pants in 34", 36", 38", and 40" inseams. See Extra Long Maternity category for tall clothing. Plus sizes available for women's tall clothing. Based in Australia. Boot Barn - $ | up to 36" inseam | Western clothing. Find Wranglers and other brands of western wear denim in 34" and 36" inseams. Buckle - $$ | up to 37" inseam | Casual apparel targeting the younger crowd. Large selection of mid-priced and designer jeans and pants in up to 37" inseams. Shop by inseam. Also has longer length tops. Shop online or at retail locations. Cabela's - $ | up to 38" inseam | Casual, outdoor clothing. Long size jeans in 34" and 36" inseams. Select denim in up to 38" inseams. Also find outdoor and hiking pants in 34" inseams as well as a few styles with the option to hem up to a 35.5" inseam. Extended sizes available for women's tall clothing. Shop online or at retail locations. Chadwick's - $ | up to 35" inseam | Fashionable, classic-style clothing. Tall size ladies jeans and pants in 34" and 35" inseams. Also offers tops, dresses, skirts, businesswear, and jackets in women's tall clothing sizes. Select the Tall category to view all tall clothing. Charlie M. Denim - $$$ | up to 37" inseam | Offers a stylish collection of premium women's tall jeans in 34" and 37" inseams. Also has tall size denim jackets. Charlotte Russe - $ | 34" inseam | Casual apparel targeting the younger crowd. Selection of long juniors jeans in 34" inseams. To find, search for '34" inseam' in the search box on the site. Also offers longer lengths tops. Shop online or at retail locations. Chico's - $$ | up to 35" inseam | Sophisticated, classic style. Tall size jeans in 35" inseams and pants in 34.5" inseams. Select Tall under the Inseam menu. Plus sizes available for women's tall clothing. Shop online or at retail locations. CJ Banks - $ | up to 35" inseam | Tall plus size clothing to size 32. Find plus size tall jeans and pants in up to 34" inseams. Shop by size in the Sizes & Lengths section. Couture Candy - $$$$ | up to 36" inseam | Designer clothing. Find top brand names for women's tall designer jeans and pants in up to 36" inseams. To find tall sizes, search for your inseam in the search box on the site (ex. '35 inseam'). Destination Maternity - $ / $$$$$ Designer | 34" inseam | Maternity clothing store. Offers the inexpensive Motherhood brand of denim and pants in 34" inseams. Select the Tall option in the Motherhood Jeans or Pants categories. Also has a collection of brand name tall maternity designer jeans in 34" inseams. Dillard's - $ | Up to 35" inseam | Fashionable, contemporary apparel. Ladies jeans and pants can be found in long sizes. Select denim in 34" and 35" inseams. Inseam information isn't available for all other tall bottoms. Under the Women and Juniors sections, select Denim or Pants and then select your size. Shop online or at retail locations. Dorothy Perkins - $ | 36" inseam | Jeans, pants, and trousers in 91 cm inseams (approximately 36" inseams). Also offers tops, dresses, and maternity in longer proportions. See the Women's Tall Clothing section. Shop online or at retail locations. Based in the U.K.
Eddie Bauer - $$ | 36" inseam | Casual and outdoor styles as well as professional businesswear. Most of the entire women's collection including jeans, pants, tops, dress shirts, sweaters, dresses, skirts, suits, outerwear, sleepwear, and swimwear are available in tall. Ladies pants and denim have a 36" inseam. Plus sizes available. Shop online or at retail locations. Everyday Maternity - $$ | 34" inseam | Maternity clothing store. Offers a selection of tall maternity pants and jeans in 34" inseams. See the Long Maternity Trousers category. Based in the U.K.
EXPRESS - $$ | 35" inseam | Fashionable, contemporary apparel. Long jeans and pants with inseams of 35". In the Jeans and Pants categories, select your size from the drop-down menu. Shop online or at retail locations.